Yesterday morning, as I was recovering from working on stage crew for the 34th Reggae on the River (fundraiser for the non profit, the Mateel Community Center), I noticed on social media that there was an M 6.9 earthquake in Lombok, Indonesia. This is sad because of the likelihood for casualties and economic damage in this region. However, it is interesting because the earthquake sequence from last week (with a largest earthquake with a magnitude of M 6.4) were all foreshocks to this M 6.9. Now, technically, these were not really foreshocks. The M 6.4 has an hypocentral (3-D location) depth of ~6 km and the M 6.9 has an hypocentral depth of ~31 km. These earthquakes are not on the same fault, so I would interpret that the M 6.9 was triggered by the sequence from last week due to static coulomb changes in stress on the fault that ruptured. Given the large difference in depths, the uncertainty for these depths is probably not sufficient to state that they may be on the same fault (i.e. these depths are sufficiently different that this difference is larger than the uncertainty of their locations). I present a more comprehensive analysis of the tectonics of this region in my earthquake report for the M 6.4 earthquake here. I especially address the historic seismicity of the region there. This M 6.9 may have been on the Flores thrust system, while the earthquakes from last week were on the imbricate thrust faults overlying the Flores Thrust. See the map from Silver et al. (1986) below. I include the same maps as in my original report, but after those, I include the figures from Koulani et al. (2016) (the paper is available on researchgate). Based on Eric Fielding and JD Dianala’s interpretation of the InSAR data, the M 6.4 and M 6.9 earthquakes could possibly have a similar hypocentral depth. See Social Media update below. Find out more about InSAR (Interferometric Synthetic Aperture Radar) here. In addition, as Dr. Anthony Lomax pointed out, the USGS depth uncertainty is large enough for these earthquakes that they may be along the same fault. Dr. Fielding uses the InSAR data (see update below) to interpret the fault geometry. It is difficult to say if there will be a larger or another large earthquake or not. Based upon historic seismicity, the M 6.9 is probably the mainshock in this sequence. But the historic record is short (100 yrs +-), so may not be a perfect sample of what could happen. The M 6.9 probably ruptured the Flores thrust fault, a back thrust to the subduction zone. There is probably a small chance that the Flores thrust fault (east west fault dipping to the south) to the east and west of the M 6.9 has an increased amount of stress imparted upon it from the M 6.9 (small amount, so if the fault was almost ready to go, this change might make it go). but this is a small possibility (but still possible). (i.e. Bali). There is also a small chance that the subduction zone (south of the islands, dipping to the north) also has an increased amount of stress from this M 6.9 earthquake. but this is probably less likely than the other example (due to the distance between the M .6.9 and the subduction zone fault. Though there will probably be earthquakes up to M 5 or mid M 5 as aftershocks… and as time passes, the chance of a larger earthquake diminish to the background risk of such an earthquake. by the time it is Sept through Dec, we will probably have passed the increased risk due to the M 6.9 sequence. But we must always remember, we cannot absolutely know what will happen. our observational history is only a few centuries and seismometers are only a century old (and modern ones, with a global network, maybe 50 years). so it is challenging to think that we know about how this region (or any region) behaves tectonically. I prepared an updated report given the new M 6.9 earthquake from today (8/19/2018) here. I plot the seismicity from the past month, with color representing depth and diameter representing magnitude (see legend). I include earthquake epicenters from 1918-2018 with magnitudes M ≥ 6.0 in one version. In the upper right corner is a low angle oblique view of the Sunda subduction zone beneath Java, Bali, Lombok, and Sumbawa (from Earth Observatory Singapore). I place a blue star in the general location of today’s earthquake’s epicenter (as for all figures here). The India-Australia plate is subducting northwards beneath the Sunda plate (part of the Eurasia plate). In the upper left corner is a map from Koulali et al. (2016) that presents a plate tectonic map for this region. They present earthquake mechanisms for some historic earthquakes. These authors favor the interpretation that the Flores thrust fault system extends to eastern Java. To the right of the Koulali et al. (2016) map is a cross section of seismicity presented by Hengresh and Whitney (2016). These authors argue for a north vergent Flores thrust in this region, though most of their work was on the subduction/collision zone. In the lower right corner is another Koulali et al. (2016) map that shows the relative amount of motion across these plate boundary fault systems as modeled in their analysis. Based on their modeling, there is about 10-20 mm/yr of strain accumulating on the Flores thrust system north of Lombok, Indonesia. In the lower left corner is a Koulali et al. (2016) that shows their estimate of this strain accumulation (via fault slip deficit) for the Flores thrust fault. Here is the map with a centuries’ seismicity plotted. Here is the interpretive posted from last week, with historic seismicity and earthquake mechanisms. Below is a map showing historic seismicity (Jones et al., 2014). Cross sections B-B’ and C-C’ are shown. The seismicity for the cross sections below are sourced from within each respective rectangle. Here are the seismcity cross sections. Here is the map from McCaffrey and Nabelek (1987). They used seismic reflection profiles, gravity modeling along these profiles, seismicity, and earthquake source mechanism analyses to support their interpretations of the structures in this region. 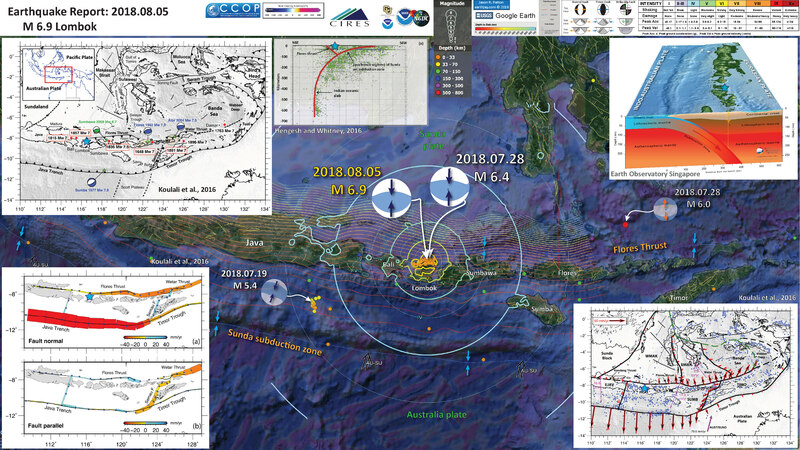 Tectonic and geographic map of the eastern Sunda arc and vicinity. Active volcanoes are represented by triangles, and bathymetric contours are in kilometers. Thrust faults are shown with teeth on the upper plate. The dashed box encloses the study area. 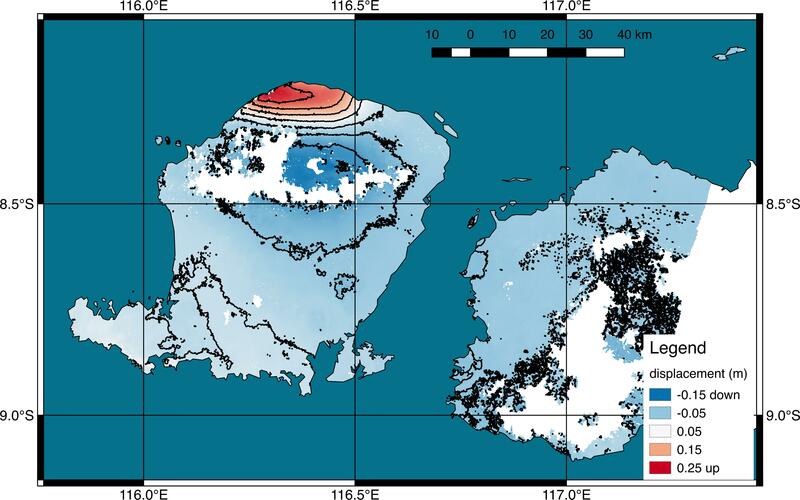 Here is the Audley (2011) cross section showing how the backthrust relates to the subduction zone beneath Timor. I include their figure caption in blockquote below. Cartoon cross section of Timor today, (cf. Richardson & Blundell 1996, their BIRPS figs 3b, 4b & 7; and their fig. 6 gravity model 2 after Woodside et al. 1989; and Snyder et al. 1996 their fig. 6a). Dimensions of the filled 40 km deep present-day Timor Tectonic Collision Zone are based on BIRPS seismic, earthquake seismicity and gravity data all re-interpreted here from Richardson & Blundell (1996) and from Snyder et al. (1996). NB. The Bobonaro Melange, its broken formation and other facies are not indicated, but they are included with the Gondwana mega-sequence. Note defunct Banda Trench, now the Timor TCZ, filled with Australian continental crust and Asian nappes that occupy all space between Wetar Suture and the 2–3 km deep deformation front north of the axis of the Timor Trough. Note the much younger decollement D5 used exactly the same part of the Jurassic lithology of the Gondwana mega-sequence in the older D1 decollement that produced what appears to be much stronger deformation. This are the seismicity cross sections from Hangesh and Whitney (2016). These are shown to compare the subduction zone offshore of Java and the collision zone in the Timor region. Comparison of hypocentral profiles across the (a) Java subduction zone and (b) Timor collision zone (paleo-Banda trench). Catalog compiled from multiple reporting agencies listed in Table 1. Events of Mw>4.0 are shown for period 1815 to 2015. Here is a map of the same general area from Silver et al. (1986), used here to locate the following large scale map. Location of SeaMARC II survey (Plate 1 and Figures 2) and geographic features discussed in text. Triangles on upper plates of thrust zones. This is the large scale map showing the detailed thrust fault mapping (Silver et al., 1986). Bathymetry, faults, and mud diapirs of the central Flores thrust zone, based on interpretation of SeaMARC II data and seismic reflection profiles. Shown also are locations (circled numbers) of all seismic profiles. Mud diapirs are solid black. Triangles on upper plates of thrust faults. Here is the tectonic map from Hangesh and Whitney (2016). Illustration of major tectonic elements in triple junction geometry: tectonic features labeled per Figure 1; seismicity from ISC-GEM catalog [Storchak et al., 2013]; faults in Savu basin from Rigg and Hall  and Harris et al. . Purple line is edge of Australian continental basement and fore arc [Rigg and Hall, 2011]. Abbreviations: AR = Ashmore Reef; SR = Scott Reef; RS = Rowley Shoals; TCZ = Timor Collision Zone; ST = Savu thrust; SB = Savu Basin; TT = Timor thrust; WT =Wetar thrust; WASZ = Western Australia Shear Zone. Open arrows indicate relative direction of motion; solid arrows direction of vergence. Here are some focal mechanisms from earthquakes in the region from Hangesh and Whitney (2016). Symbol color represents depth. (a) Focal mechanism solutions for the study region. The focal mechanisms are classified based on depth intervals to illustrate the style of faulting within the different structural domains. Note (b) sinistral reverse motion along Timor trough, (c) subduction related pattern along Java trench, and dextral solutions along the western Australia extended margin (Figure 4a) north of 20°S. Centroid moment tensor (CMT) solutions [Dziewonski et al., 1981] are from the CMT project [Ekström et al., 2012; http://www.globalcmt.org/CMTcite.html] for events of Mw>5.0 for the period 1976 onward. Here is a figure showing the regional geodetic motions (Bock et al., 2003). I include their figure caption below as a blockquote. Topographic and tectonic map of the Indonesian archipelago and surrounding region. 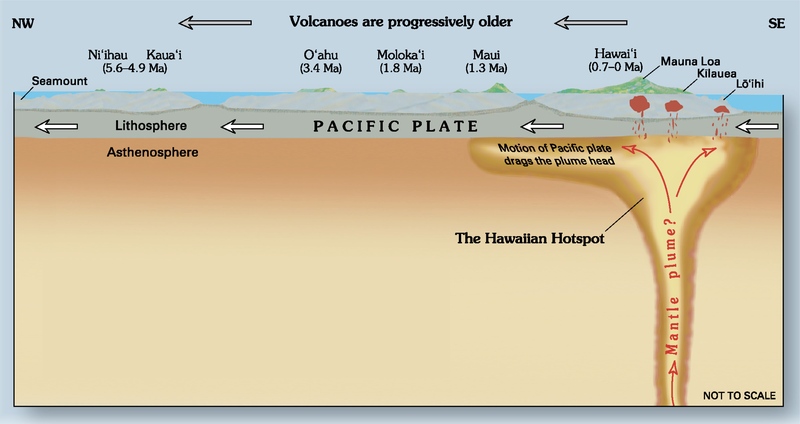 Labeled, shaded arrows show motion (NUVEL-1A model) of the first-named tectonic plate relative to the second. Solid arrows are velocity vectors derived from GPS surveys from 1991 through 2001, in ITRF2000. For clarity, only a few of the vectors for Sumatra are included. The detailed velocity field for Sumatra is shown in Figure 5. Velocity vector ellipses indicate 2-D 95% confidence levels based on the formal (white noise only) uncertainty estimates. NGT, New Guinea Trench; NST, North Sulawesi Trench; SF, Sumatran Fault; TAF, Tarera-Aiduna Fault. Bathymetry [Smith and Sandwell, 1997] in this and all subsequent figures contoured at 2 km intervals. This map from Hangesh and Whitney (2016) shows the GPS velocities in this region. Note the termination of the Flores thrust and the north-northeast striking (oriented) cross fault between Lombok and Sumbawa. GPS velocities of Sunda and Banda arc region. Large black and grey arrow shows motion of Australia relative to Eurasia [DeMets et al., 1994]. Thin black arrows show GPS velocities of Sunda and Banda arc regions relative to Australia [Nugroho et al., 2009]. Seismicity from ISC-GEM catalog [Storchak et al., 2013]. Note reduction of station velocities from west to east indicating progressive coupling of the Banda arc to the Australian plate compared to the area along the Sunda arc. Below are the 4 figures from Koulani et al., 2016. First is the plate tectonic map. I include their figure captions in block quote. Seismotectonic setting of the Sunda-Banda arc-continent collision, East Indonesia. Major faults (thick black lines) [Hamilton, 1979]. Topography and bathymetry are from Shuttle Radar Topography Mission (http://topex.ucsd.edu/www_html/srtm30_plus.html). Focal mechanisms are from the Global Centroid Moment Tensor. 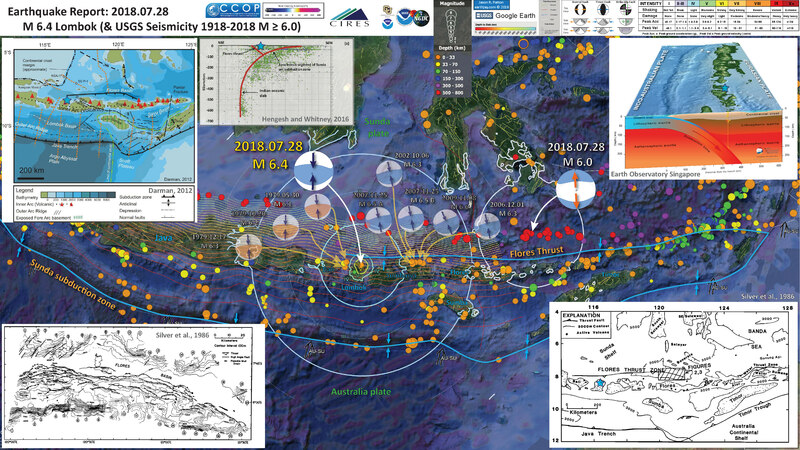 Blue mechanisms correspond to earthquakes with Mw>7 (brown transparent ellipses are the corresponding rupture areas for Flores 1992 and Alor 2004 earthquakes), while the green focal mechanism shows the highest magnitude recorded in Sumbawa. Red dots indicate the locations of major historical earthquakes [Musson, 2012]. This figure shows their estimates for plate motion relative velocities as derived from GPS data, constrained by the fault geometry in their block modeling. GPS velocities determined in this study with respect to Sunda Block. Uncertainty ellipses represent 95% confidence level. The inset figure corresponds to the area of the dashed rectangle in the map. Light blue arrows show the velocities for East and West Makassar Blocks. This figure shows their estimates of slip rate deficit along all the plate boundary faults in this region. Relative slip vectors across block boundaries, derived from our best fit model. Arrows show motion of the hanging wall (moving block) relative to the footwall (fixed block) with 95% confidence ellipses. The tails of arrows is located within the “moving” block. Black thick lines show well-defined boundaries we use as active faults in our model and dashed lines show less well-defined boundaries (green : free-slipping boundaries and black: fixed locked faults) . Principal axes of the horizontal strain tensor estimated for the SUMB, EMAK, and EJAV are shown in pink. The thick pink arrow shows the relative motion of Australia with respect to Sunda (AUST/SUND). Abbreviations are Sumba Block (SUMB), West Makassar Block (WMAK), East Makassar Block (EMAK), East Java Block (EJAV), and Timor Block (TIMO). The background seismicity is from the International Seismological Centre catalog with magnitudes ≥5.5 and depths <40 km. 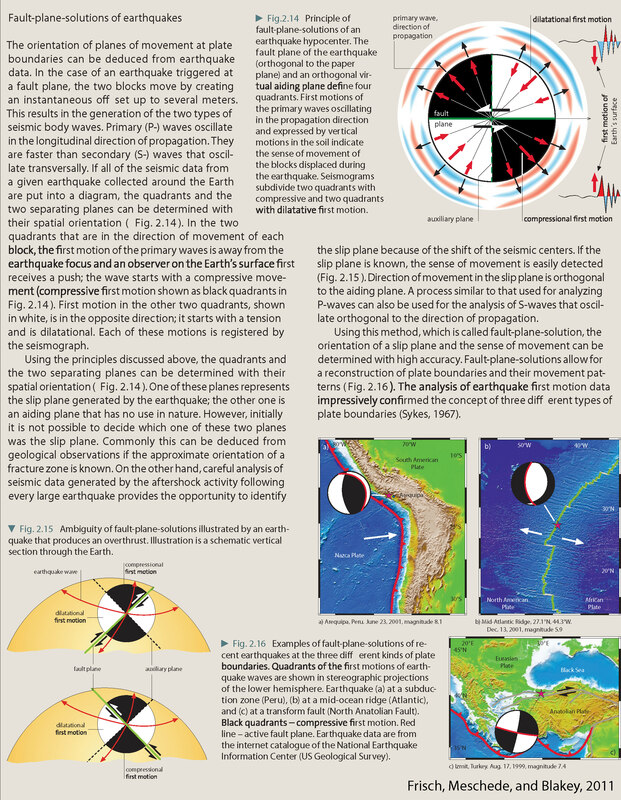 Here is their figure that shows the slip deficit along the plate boundary faults. Fault slip rate components: (a) fault normal (extension positive) and (b) fault parallel (right-lateral positive). 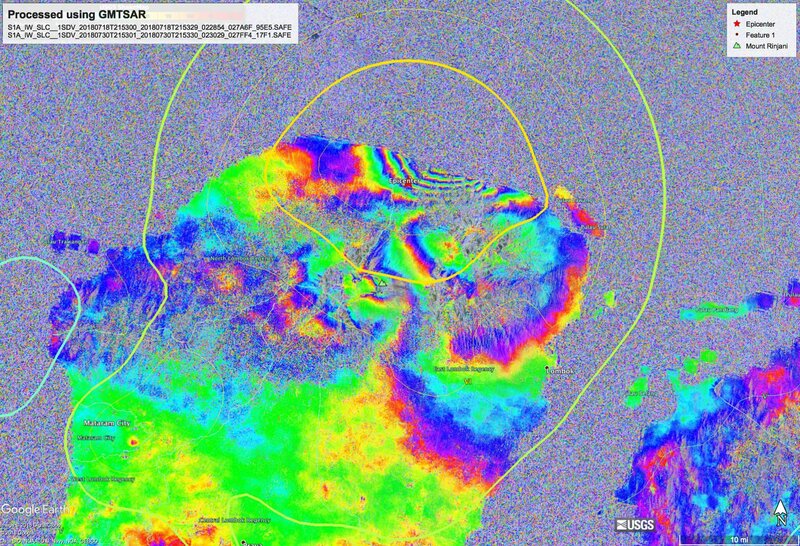 Here is the InSAR result from Eric Fielding at NASA, the files are available here. These data are from a change in position between 2018.07.30 and 2018.08.05, so they compare the ground motion of only the M 6.9 earthquake (generally speaking). Black contours are 5 cm (2 inches). Copernicus Sentinel-1 data acquired on 30 July and 5 August 2018. White areas where measurement not possible, largely due to dense forests. Measurements with #InSAR are in direction towards satellite, so not purely vertical or horizontal. Mostly vertical in this case. 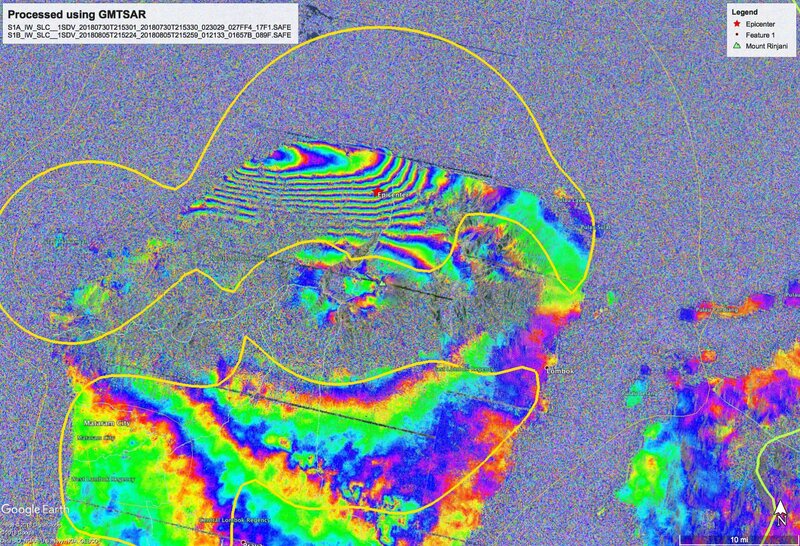 These two InSAR images allow us to compare ground deformation from these two earthquakes. Rusi P presents these results on twitter here. This tweet is also posted below in the Social Media section. This is the analysis for the M 6.4 earthquake. This interferogram is made from SAR data collected on 7/18 and 7/30. This is the analysis for the M 6.9 earthquake. This interferogram is made from SAR data collected on 7/30 and 8/05. Here are high-frequency estimates of apparent rupture duration for large earthquakes 1992-2012 compared to Global CMT (Lomax & Michelini, 2012). Q: What is the probability that an #earthquake is a foreshock to a larger earthquake? Audley-Charles, M.G., 1986. Rates of Neogene and Quaternary tectonic movements in the Southern Banda Arc based on micropalaeontology in: Journal of fhe Geological Society, London, Vol. 143, 1986, pp. 161-175. Audley-Charles, M.G., 2011. Tectonic post-collision processes in Timor, Hall, R., Cottam, M. A. &Wilson, M. E. J. (eds) The SE Asian Gateway: History and Tectonics of the Australia–Asia Collision. Geological Society, London, Special Publications, 355, 241–266. Baldwin, S.L., Fitzgerald, P.G., and Webb, L.E., 2012. Tectonics of the New Guinea Region in Annu. Rev. Earth Planet. Sci., v. 41, p. 485-520. Benz, H.M., Herman, Matthew, Tarr, A.C., Hayes, G.P., Furlong, K.P., Villaseñor, Antonio, Dart, R.L., and Rhea, Susan, 2011. Seismicity of the Earth 1900–2010 New Guinea and vicinity: U.S. Geological Survey Open-File Report 2010–1083-H, scale 1:8,000,000. Darman, H., 2012. Seismic Expression of Tectonic Features in the Lesser Sunda Islands, Indonesia in Berita Sedimentologi, Indonesian Journal of Sedimentary Geology, no. 25, po. 16-25. Hangesh, J. and Whitney, B., 2014. Quaternary Reactivation of Australia’s Western Passive Margin: Inception of a New Plate Boundary? in: 5th International INQUA Meeting on Paleoseismology, Active Tectonics and Archeoseismology (PATA), 21-27 September 2014, Busan, Korea, 4 pp. Jones, E.S., Hayes, G.P., Bernardino, Melissa, Dannemann, F.K., Furlong, K.P., Benz, H.M., and Villaseñor, Antonio, 2014. Seismicity of the Earth 1900–2012 Java and vicinity: U.S. Geological Survey Open-File Report 2010–1083-N, 1 sheet, scale 1:5,000,000, https://dx.doi.org/10.3133/ofr20101083N. Okal, E. A., & Reymond, D., 2003. The mechanism of great Banda Sea earthquake of 1 February 1938: applying the method of preliminary determination of focal mechanism to a historical event in EPSL, v. 216, p. 1-15.